The One Korea Global Campaign is reconnecting to the spirit of the independence movement that motivated leaders like Ahn Changho. Events and projects commemorating the March 1, 1919 movement are inspiring and engaging Koreans from all walks of life and around the world through the Korean Dream, a vision of an enlightened nation that serves the greater good of all humanity. The essential elements for building such a nation requires a unified, ethical people that cherish the freedoms and rights of all its citizens. The One Korea Global Campaign aspires to fulfill the hopes and dreams of the Korean Independence Movement, thereby honoring the legacy of the leaders such as Ahn Changho who dedicated their lives to these noble ideals. The following story can be found on 1dream1korea.com. In 2012, footsteps were added to honor Ahn Changho, a leader of the Korean Independence Movement and the Korean-American community in California. Ahn Changho’s story is a part of the ongoing struggle of the Korean people to create a nation that honors the civil rights of all Koreans. This year, as Korea marks the 100th anniversary of its Independence Movement that began on March 1, 1919, we are reminded of the fact that Korea remains divided and unfree. Ahn Changho tasted the salty mist from the waves gently lapping against the ship. The tranquility of the clear blue waters stretching out freely in all directions was in stark contrast to the increasing social restrictions and chaos of his beloved Korean homeland. At the edge of the horizon, he saw green patches of land and, as the ship sailed closer, a mountain appeared. Just as the island was isolated in the vast ocean, Ahn Changho felt alone in the sea of social upheaval. But the magnificent mountain ahead towered high above the waters with great strength. This image inspired him to determine to become a man of great moral character and inner strength that could rise above the challenges of his time. It was from this determination that he gave himself the pen name Dosan, meaning island mountain. It was 1902, and Ahn Changho stood beside his new bride, Lee Hye Ryeon, on a ship stopping in Honolulu before heading toward their final destination of San Francisco. They were the first Korean married couple that immigrated to America. Ahn Changho wanted to learn more about Christianity and the American education system in order to eventually return to Korea to reform and modernize its’ feudal society and education system. At the time, Japan was acquiring increasing economic and political control over Korea, and by 1910, Korea had lost its national sovereignty to Japan. During the decades under colonial rule, the Korean people faced limited freedom in their practice of religion and economic activities and a loss of cultural identity, progressively leading to restrictions even on the teaching of Korean language and history in schools. Despite their suffering, the hope of creating a free, independent, and prosperous nation burned in the hearts of many Koreans including Ahn Changho. 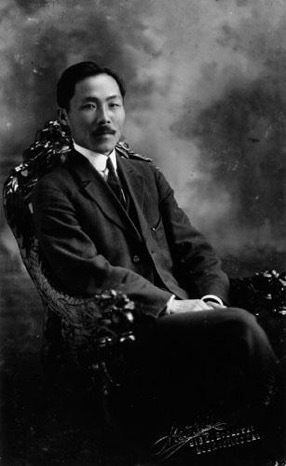 He founded several organizations in San Francisco to support the Korean Independence Movement such as the Korean National Association (Kook Min Hoe) and the Young Korean Society (Hung Sa Dan). 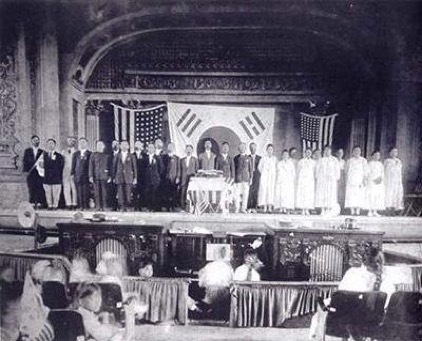 He helped to organize the first Korean Methodist Church in America in which some church members donated half of their often-meager wages to support the Independence Movement. He also founded the New Peoples Association (Sin Min Hoe) when he returned to Korea in 1907, a secret underground organization to support the Independence Movement. Ahn Changho looked beyond the immediate goal of independence. He urged people to consider how a newly independent nation could become strong and prosperous. His unequivocal response to his own question was the moral health of a nation’s own citizens. "The purpose of the organization is to build a foundation for the prosperous future of our nation by uniting loyal and upright men and women who will devote their lives to seeking the truth and to doing rather than pretending; who will cultivate the virtue of mutual helpfulness and develop sound character through united moral, physical, and intellectual discipline; and who will build a solid and firm organization." Ahn Changho was critical of Korean society, calling it morally bankrupt and in need of intense reform – but at the hands of its own citizens. He believed that reforming individual character, promoting the value of seeking truth, right action, loyalty and bravery were the most important qualities that could lead to national reform. His social organizations reflected these views and he inspired many to pursue these qualities as the only surefire way to secure lasting freedom and independence of the Korean homeland. Ahn Changho was a sincere leader in the Korean Independence Movement. He dreamed and fought for a free and virtuous nation, sacrificing the needs of his family to travel to Korea and China, and faced imprisonment several times for staying true to his beliefs. 100 years after the March 1, 1919 Independence Movement, Korea stands at a crossroads, just as it did a century ago. Ahn Changho’s emphasis on envisioning a new nation of high ideals and cultivating the “sound character” of the forefathers of such a nation rings true today as it did then. At this critical juncture for the Korean peninsula, the Korean people have a significant opportunity to cast a vision for the way forward for their currently divided homeland. Envisioning the type of nation the unified Korea Dream will be is a vital first step.